The supratrochlear nerve block is often performed in conjunction with the supraorobital nerve block to achieve regional anesthesia over the ipsilateral forehead. A frequent indication for this block is to facilitate repair of scalp lacerations without the distortion of anatomy that a local field block can cause. This block has also been used to provide anesthesia for scalp excisions, frontal craniotomies, or frontal ventriculo-peritoneal shunts. It may also be used in conjunction with steroid injections for post-herpetic neuralgia or trigeminal neuropathies. Sensory innervation to the face is provided by the trigeminal cranial nerve (CNV), which branches into the ophthalmic (V1), maxillary (V2) and mandibular (V3) nerves. The ophthalmic nerve provides sensory innervation to the scalp, forehead, upper eyelid, conjunctiva, and cornea. It also provides partial innervation to the nose, nasal mucosa, and meninges. After exiting the skull, both the supraorbital and supratrochlear nerves pass superiorly to provide sensory innervation to the forehead. Specifically, the supratrochlear nerve supplies sensory innervation to the skin of the lower part of the forehead near the midline, the conjunctiva, and the upper eyelid. The approximate distribution of the nerves and the sensory distribution can be seen in Figure 2. 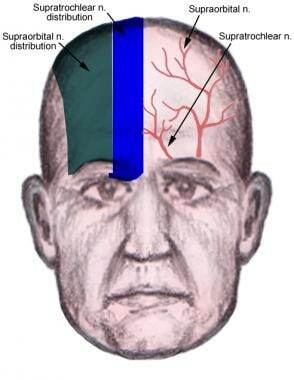 See Medscape Reference article Forehead Anatomy for more information. The patient can be positioned either supine or seated, facing the person performing the block. The entire supraorbital ridge on the side to be blocked is prepped using sterile technique with providone-iodine or chlorhexadine, being careful to avoid contact of the cleaning solution with the eyes. Sedation (e.g., 1-2 mg of midazolam and 25-50mcg of fentanyl) can be provided to the patient as necessary. 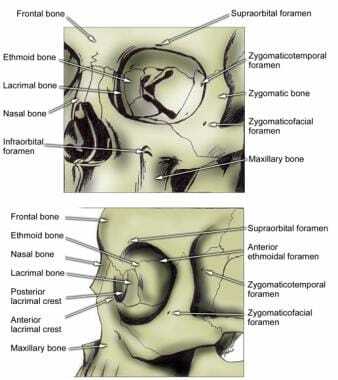 As the supratrochlear foramen/notch can be hard to palpate (or even absent in some patients), the supraorbital foramen is often used as a landmark. The supraorbital foramen can be felt as a slight indentation located 2-3 centimeters from midline (often above the pupil), at the inferior border of the supraorbital ridge. The target area for insertion is on the supraorbital ridge approximately 1cm medial to the supraobital notch, between the notch and the bridge of the nose. A 25 or 27 gauge, 1 ½ inch needle is inserted into the skin and advanced medially into the subcutaneous tissue. After gentle aspiration to confirm that the needle tip is not intravascular, the local anesthetic of choice (e.g., 3ml 0.25% bupivicaine) is injected in a fanlike distribution. 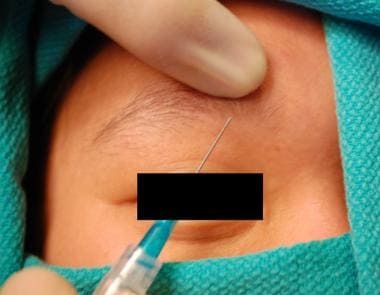 Although some stinging is to be expected with local infiltration, the needle should be redirected if the patient experiences paresthesias or sharp pain during needle insertion or local injection. As with any nerve block, bleeding, infection, and nerve damage are possible. An allergic reaction to the anesthetic agent is also possible. The amount of local anesthetic reasonably used for this procedure is far less than toxic dose of local anesthetic. Nonetheless, routine care should be taken to prevent intravascular injection, especially in pediatric patients in whom the amount of anesthetic used represents a proportionately higher dose by weight. Swelling or ecchymosis may result if the injectate infiltrates into the loose areolar tissue of the eyelid. To prevent this, it may be helpful to use a finger or gauze to apply gentle pressure to the upper eyelid prior to, and several minutes after, local injection. Commonly used local anesthetics include lidocaine 1% and bupivicaine 0.25% or 0.5%. Lidocaine will have a faster onset of action (within 3-5 minutes) and a duration of approximately 30-60 minutes. Bupivicaine will have a slower onset of action (5 minutes), but will have a longer duration of action of approximately 4-5 hours. The addition of a small amount of bicarbonate (e.g., 1ml in 20 ml of local anesthetic) can reduce the pain associated with injection and decrease the time to onset of the block by facilitating intracellular entry of the anesthetic. Vasoconstriction caused by the addition of dilute epinephrine (1:200,000) to the injectate can increase the duration of the block. See Medscape Reference article Infiltrative Administration of Local Anesthetic Agents for more information. The injection of a depot steroid (e.g., 40-80mg of triamcinolone) may provide more long-lasting analgesia for treatment of conditions such as post-herpetic neuralgia or supratrochlear neuropathy. Gray H, Lewis WH. Anatomy of the Human Body: 5e. The Trigeminal Nerve. Bartleby.com. Available at http://www.bartleby.com/107/200.html. Accessed: October 2, 2011. Webster RC, Gaunt JM, Hamdan US, Fuleihan NS, Giandello PR, Smith RC. Supraorbital and supratrochlear notches and foramina: anatomical variations and surgical relevance. Laryngoscope. 1986 Mar. 96(3):311-5. [Medline]. Zide BM, Swift R. How to block and tackle the face. Plast Reconstr Surg. 1998 Mar. 101(3):840-51. [Medline]. Waldman SD. Atlas of Interventional Pain Management, ed 2. Philadelphia, Saunders; 2004. p 42.